Today it’s my turn to share my little scrap place. My two girls are still living with us but it will not be long before they will leave the nest. Always kidding them by asking them when they will leave so that I can redecorate their rooms into a scraproom. Shhh(don’t tell)…the truth is I love having them around me! Packed with projects just for me, but also a lot of projects waiting for a new home. Love to give them as gifts to my family and friends! The keyboard and the guitar is from hubby. This is the other side of my living room with a view of my small backyard. 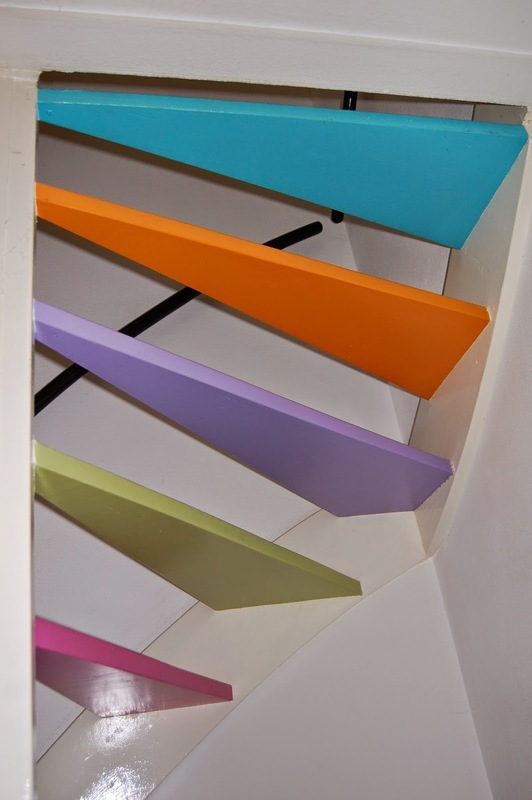 Painted my stairway some years ago. All the colors still makes me very happy! A rare view of one side of my living room…..empty dinner table! Darling daughter finally has a chance to actually sit at that table! I always try to clean up the table after every project. Doesn’t always works that way but I kinda like all the goodies at my display! Boxes, boxes and boxes everywhere! This is what my table looks like after another Maja project! I have to admit I have a crazy obsession to find it difficult to throw anything away from all of those papers. Every little piece I have to keep and I even save all the leftovers from my punched flowers! All my painting is done in my kitchen. It’s very small but somehow I find a way to work between all the cups and plates!